Venus Williams fell to a tough Lucie Safarova in the first round of the W&S Open. Following his magical run in Toronto, Jo-Wilfried Tsonga just didn't have enough to defeat Mikhail Youzhny today. How tough is the US Open Series summer of tennis? Just ask Venus Williams and Jo-Wilfried Tsonga. A finalist and champion, respectively, at the Rogers Cup in Canada last week, Williams and Tsonga combined for an 11 match wins in the span of seven days. But Tuesday they were both bundled out of the Western & Southern Open in Cincinnati in opening-round matches, victims perhaps of fatigue, but also of the packed draws that the U.S. hardcourt swing come along with in the lead-up to the year’s final major. Her first-round opponent was world No. 17 Lucie Safarova, a semifinalist at Wimbledon just last month. 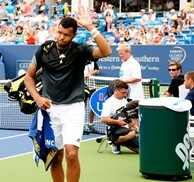 Tsonga, the 12th seed, drew Mikhail Youzhny, a two-time US Open semifinalist (2006 and 2010) and a current world No. 25 that has Wimbledon just last month. Tsonga, the 12th been ranked as high as No. 8. Unlike the majors, when top players often face qualifiers or opponents outside the top 50 to start in order to work their way into a tournament, champions like Williams and Tsonga have no respite during US Open Series events. This week in Cincinnati, main draw cutoffs were No. 43 (women) and No. 57 (men). Only four times since 1995 has any man won Canada and Cincinnati – the biggest events of the US Open Series – back-to-back: Andre Agassi (1995), Patrick Rafter (1998), Andy Roddick (2003) and Rafael Nadal (2013). The latter three went on to win the US Open. Late Tuesday afternoon Andrea Petkvoic, a semifinalist at the French Open this year, faced Sloane Stephens, the rising American star and former world No. 11, in a first round match. That came after five-time Slam champion Maria Sharapova bested up-and-comer Madison Keys, albeit in a second-round battle. It wasn’t easy, however, Sharapova needing three sets to take down the world No. 28. Wednesday, world No. 1 Serena Williams will take on Sam Stosur in round two, a rematch of the 2011 US Open final. Wimbledon finalist Genie Bouchard gets two-time major winner Svetlana Kuznetsova in her first match in Cincy. Roger Federer, who lost to Tsonga in the Toronto final, gets another young gun in Vasek Pospisil, the dangerous Canadian, to start.